Home → Mattress Protectors → Danican Waterproof Mattress Protector → Why Use a Natural Latex Topper on Your Mattress? Natural Latex Mattress Toppers are thee most versatile products on the market. 1) Soften and make comfortable, a too firm mattress. 2) Make an old mattress feel like new again. 3) Reverse the problems you’re having with new mattress that is laden with memory foam. 4) Make a mattress that sleeps hot, sleep cool. All Natural Latex Foam Rubber starts with the sap from the rubber tree. First discovered in the 1880s and first used as a mattress in the 1920s, all natural latex is and has been thee best, (most comfortable and most durable), upholstery material for nearly 100 years. Latex foam, (unlike latex gloves and bandages), is hypo-allergenic. All Natural Latex Foam remains “Like New” for many years…making it far less expensive than anything else you can buy…due to its long term use. An All Natural Latex Topper extends the life of any mattress you use under it, making it one of those rare products that more than pays for itself. The Reasons for Needing and Using a Latex topper. Over the last 10-15 years, memory foam has wormed its way into most of the mattresses made today. Memory foam is very comfortable, initially, and that makes mattresses easy to sell. However, memory foam loses that initial comfort rather quickly. Memory foam is the only temperature sensitive material on the market….meaning that it softens as it warms from the heat your body gives off. Once warmed, you sink into it…something you experience once it’s in your home…and not when you tried it on the showroom floor. Memory foam isn’t very resilient, so after a few months of this nightly ritual of warming and softening, it’s pretty well shot. You sink through it, as if it were’n’t even there. The result is, your body hits the firmer materials under it…your hips hurt and because of you’ve sunken into it, your spine is no longer properly aligned…it causes back pain. One of the other negative side effects of memory foam being temperature sensitive, is that once it absorbs your body’s heat, it reflects it back to you…causing you to sleep hot. Latex Toppers have become so popular because they counter the negative side effects of memory foam. Latex is and has been thee best upholstery material for the last 100 years. It’s nothing new/only the best…or “Solo Il Meglio”, as my grandfather used to say. Latex does everything that memory foam is purported to do…does it much better and for far longer…and, latex sleeps cool. Latex is NOT temperature sensitive…only pressure sensitive…and is thee most resilient upholstery material on the planet. 1) It insulates you from the memory foam in the mattress…so you no longer sleep hot. 2) Absorbs all or most of your body weight. The materials inside the mattress don’t wear out as they normally would, and the mattress lasts about twice as long as it normally would. 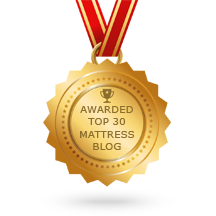 3) Provides extraordinary surface comfort to the mattress…cushioning you, but not allowing you to sink. The feel can best be described as “Zero Gravity”. There are many people who have mattresses that are older…purchased before the name brands began using so much memory foam. In the past, it has been a good idea to replace a mattress that has gotten old, just for the sake of having a fresh mattress. THAT, is no longer such a good idea. If your mattress is 15 years old or older, you bought that mattress at a time when it was nearly impossible to buy a bad mattress. Today, it’s equally impossible to buy a good one, due to all the memory foam. A person with an older, well made mattress, have been out of the buying market for some time…and tend to assume that a new mattress will also be of high quality. The name brands, that had spent decades building trust with the consumer, have betrayed that trust….trading it for higher profits. Manufacturers use memory foam to upholster a mattress, because it’s initial comfort makes it easy to sell. It’s lack of resiliency causes memory foam to sink and begin to lose its support and comfort within a matter of months. Within only a year or two, or so, it’s pretty well shot and you are in pain. The diabolical part of memory foam, is that it will return to its original shape when you get out of bed…or, close enough to it, that you will not likely prevail in a warranty claim. The result has been, more mattresses are sold more frequently to the same people…with almost none being exchanged under the terms of their warranties. Is the mattress really worn? Does it still have firm, even support, even though you may not be as comfortable on it as you once were? Are you looking to buy a mattress because, “It’s time”? Consider adding a latex topper to what you have before buying a new mattress. …and possibly eliminating the need for a new mattress at this time…and, spending hundreds instead of thousands of dollars. One of the most common ways a consumer ends up with a too firm mattress, is that the too soft one didn’t hold up…going from one extreme to the other. A too firm mattress creates pressure points…mainly at the shoulder and the hip. A too firm mattress reduces blood flow…mainly to the smaller capillaries near the surface of your skin. These things combine to cause you to spend your nights tossing and turning…and getting very little in the way of a deep, quality night’s sleep. An All Natural, Soft Latex Topper changes all that…relieving the pressure points and blood flow. The result is a much better night’s sleep and a much better next day. The benefits of a good night’s sleep is commonly known….and easily attained with the use of a Latex Topper. Which Latex Topper to Buy? Since you can get the comfort you need from any Latex Topper, let’s talk about durability and longevity. All Natural Latex…The term “All Natural” means that the latex is pure…with no synthetics, no fillers, and no chemicals….in short, the best available. Natural Latex…When you see the word, “Natural” only, the latex is blended….usually with synthetic latex. The blend is, usually, 30% natural and 70% synthetic. Synthetic Latex…Synthetic Latex is a molecular clone of real Latex. Chinese Made Latex…Both, Dunlop and Talalay Latex can be had from Chinese manufacturers, where they like to mix clay with the latex. As you shop the internet, you see latex toppers with a low price. Before you buy, ask were it’s made. I know that clay is used by the Chinese manufacturers, but only the Chinese and God, know what else is in them. There are, basically, three types of latex….Dunlop, Talalay and Sapsa. Dunlop Latex is the original process…a bit more dense than the others. The Dunlop Latex, we carry, comes from Sri-Lanka…where the rubber trees grow. Talalay Latex, named after the man who invented the process, starts with the Dunlop process, with a freezing and vacuuming step added…making it more supple than Dunlop Latex. Sapsa Latex is the synthetic latex it was more recently developed in England…and not usually available as a topper. The sap from the rubber trees, that grow in Malaysia, end up being processed in China. Our most often recommended Latex Topper is from the EverEden brand. These latex toppers are made of pure latex…100% All Natural….the best of what we carry. Here, you will find, both, Dunlop and Talalay All Natural Latex Toppers….available in your choice of Soft or Medium…and your choice of 2″ and 3″ thick.For the vast majority of you…average to above average in body weight…the 2″ Soft Talalay is the one to buy. It’s the one that gets all the rave reviews and the one my wife and I use at home. If you are smaller than average in size, then you can opt for the 3″ Soft Talalay or 3″ Soft Dunlop, should you feel the need for a greater depth of softness. 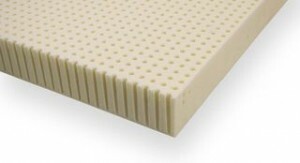 If your weight ranges between 250 and 300 Lbs., your best choice is either the 2″ Soft Dunlop or 2″ Medium Talalay. If your body weight exceeds 300 Lbs., the 2″ Medium Dunlop is your best choice. When shopping the internet for a latex topper, be aware of the ILD rating…the lower the number, the softer the latex. There are many that are labeled as “Soft”, that are the same as our Medium. We carry a number of other brands of mattress toppers…mostly latex…but innerspring and cotton, as well. Pure Talalay Bliss, (Now known as Talalay Global), is the Name Brand of the latex industry. It is made of “Natural” or blended latex. Natura, also “Natural”, blended latex…but topped with wool. Natura is a Canadian company…the only Latex Toppers we can Deliver Throughout Canada. 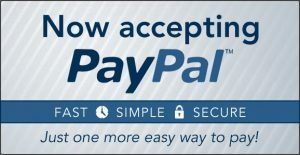 US delivery is also available. Palmpring is not only “All Natural” it is also Organic. Wolf provides us 3 unique Mattress Toppers…their Cloud Collection. Cumulus, a Pocketed Coil Topper, topped with a Poly/Cotton Blend…an excellent choice for those who have a mattress where you can feel each other move. While latex helps in this, nothing does as good of a job of reducing Motion Transfer than an individually pocketed coil. Stratus, containing Dunlop Latex, topped with a Poly/Cotton Blend. Pacific Coast Feather, for those of you looking for a Feather Bed or Alternative Down Mattress Topper.